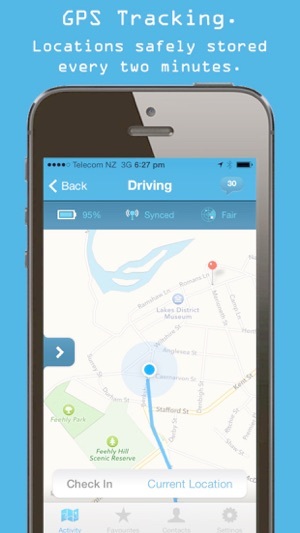 Get Home Safe is the smart way of recording what you are doing, where you are going and when you will be home safe. Simply use the app to say what you're doing. It will remind you to check-in or send a fail-safe alert if what ever you are doing doesn't go as planned! 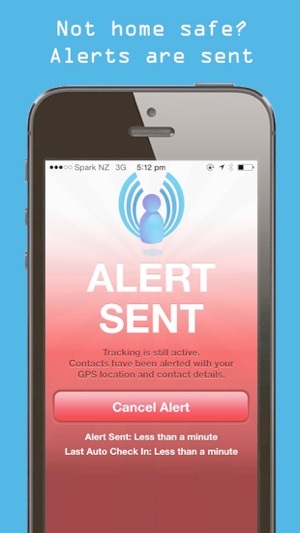 Alerts include GPS tracking, remaining battery, intended destination and a whole lot more and the best part is the alerts are sent even if your phone is not working! Be it walking home after dark, cycling, hiking or even recreational flying, we all take the time to tell someone what we are doing. Next time be smart about what you are doing and use GetHomeSafe to tell others what you are doing or where you are going. It is simple, quick and so much smarter than texting or leaving a note to say what you are doing. 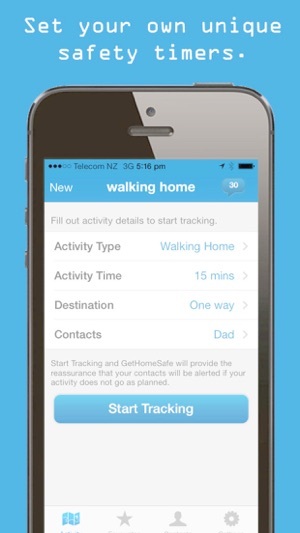 The GetHomeSafe tracking maps gives the people you choose something meaningful to follow while you are out and the GetHomeSafe timers will remind both you and your contacts what time you were meant to check in safely. Use the Favorites feature to save the details of things you do often for a quick start, just a few clicks and in under five seconds you have told someone you trust what you are doing!! Perfect for things you do often like walking home from school, running or driving. If you are a supervisor or manager responsible for lots of staff the automation of GetHomeSafe cuts the hard work (and cost) out of checking they are OK while on the road or in the field. For use in any activity where you, your family, your friends or even your boss would like some added reassurance of your personal safety. Perfect for the modern world of Uber or Lyft journeys, Tinder dates or eBay purchase pick ups. While many other safety apps charge regardless of how often you use them, with GetHomeSafe the sending of SMS is the only thing you’ll be charged for. 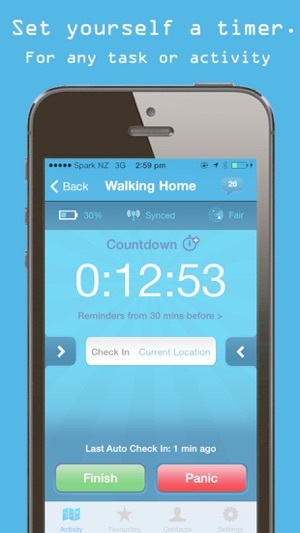 Check in on time and you won’t be charged for unused alerts! Pre-paid SMS bundles for alerts and live tracking invites can be purchased within the App. All SMS communications are backed up with an email duplicate for added reassurance of your personal safety. The email only version of GHS is intended for you to test and demonstrate the app free of charge, we highly recommend using SMS alerts for genuine use, but hey if you check in on time and you won’t be charged for unused alerts! Accidents happen all too often, and when things don’t go as planned, have GetHomeSafe at the ready to send an SOS for help when you need it most. 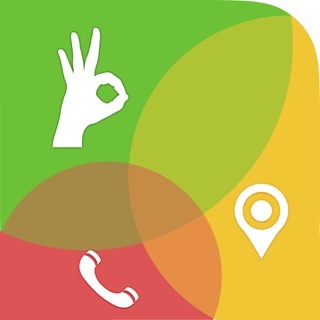 The app is ad free and user’s privacy is treated with the upper most respect. GetHomeSafe follows up to date industry best practices to ensure the safe keeping of all data and user information. * Recurring Check In : Fix for manual check-ins resetting the countdown timer to an incorrect value. * New Task : Will prompt user before discarding changes to edited task. 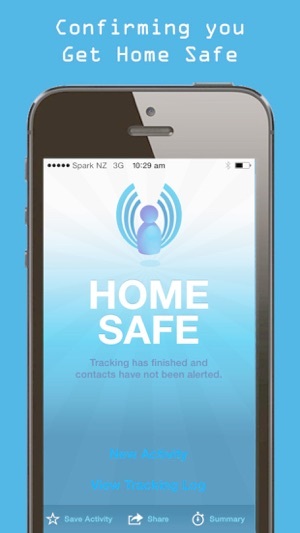 Great app to keep you safe! This is a great app! It saves your location every 2 min or so and will alert your chosen contacts if you're in trouble or don't respond to a check in alert message. This has made me feel so much more at ease when I walk places late at night! It's easy to use after the first set up but I'd recommend setting it up at home, before your first walk cause you have to fill out some info first which takes a few min (this works better in wifi.) You do have to pay for text message alerts but it's only lk $1 for 10 panic texts, otherwise it sends the alert through email. I have not had to have a panic alert sent yet so I don't know how well this works but based on the summary log of each walk, it seems to track very well. 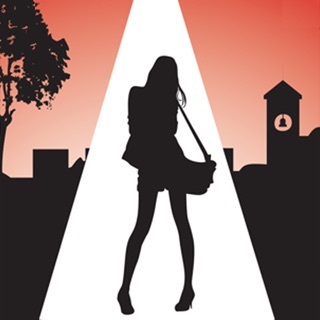 This is a great app that everyone should have if they walk alone or at night.